Toy poodles are susceptible to hypoglycemia. 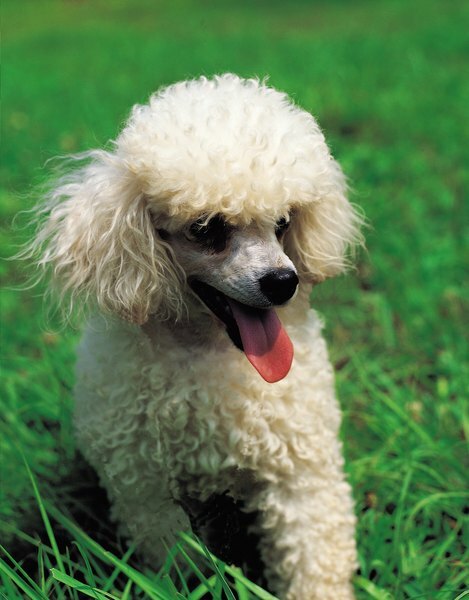 Toy poodles enjoy special attention, such as wearing sparkling collars and traveling inside large purses. However as a toy breed, they require special attention when it comes to their diet. Their metabolism is high; their stomachs are small, and things can go terribly wrong if their blood sugar gets too low. On average, protein should make up 18 percent of a dog’s diet. Unlike humans who burn carbohydrates for energy, dogs get their energy source from the proteins found in assorted meats, poultry and fish. 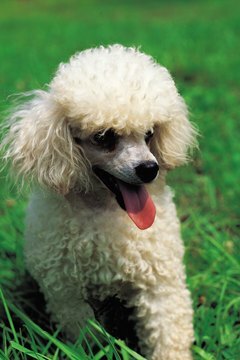 Toy poodles have high energy levels and require protein to stay healthy. Because of their tiny size, they do not eat a lot at one sitting and can burn through the nutrition of a meal quickly. As puppies they should be fed high protein, high caloric meals three to four times daily, and high protein, lower calorie meals twice daily as adults. Despite their fancy appearance, toy poodles are a robust breed like their larger cousins. However, they are vulnerable to hypoglycemia, especially between 6 and 12 weeks of age. Hypoglycemia occurs when there is an extreme drop in blood sugar, or blood glucose. Hypoglycemic attacks often occur rapidly and without warning. In puppies, hypoglycemia quickly can lead to coma, brain swelling or death if left untreated. Dogs store energy in their liver, and for toy breeds certain events can drain that reserve quickly. Hypoglycemic attacks are caused by missing a meal, prolonged exercise without a snack in between, or from getting too cold. The stress from shipping or traveling also can play a factor. Breeders need to take precautions before shipping, such as calculating travel time and weather, and owners should have a savory snack ready when picking up their new addition. Toy poodles are occasionally prone to sensitive stomachs and prolonged bouts of vomiting or diarrhea will deplete vital nutrients causing their blood sugar to drop. Warning signs of hypoglycemia include listlessness, wobbly gait and tremors. However, symptoms are not always extreme. A puppy may seem fine one minute and in a coma the next. Owners are advised to keep corn syrup or glucose paste on hand. During a hypoglycemic attack, if he's able to swallow, give him an oral dose through a syringe. If he's unconscious, rub the solution on his gums and get him to your vet immediately. Most puppies will grow out of this stage, but if attacks continue he should be tested for underlying causes such as liver shunt or infection.